Acid Dough grows vigorously during vegative and early flowering stretch. The aroma is strong so strong that the only words we could use were strong, pungent, herbal. My past grows were not so intense in smell but I’ve run these a lot cooler in flowering. It’s also worth noting that the clone mother from seed took about 13 weeks to mature, the clones taken at 3 weeks of flowering took about 11 weeks and these, which were cloned at 7 weeks of flower took only 8 weeks. Sooo I called them again. It turns out that they weren’t saying that I didn’t have a magnesium deficiency but they put the magnesium in the nitrogen boost! He said that I would have to add magnesium during flowering but wouldn’t say how much magnesium sulfate to add. I’m not going to make them a feeding schedule lol. I have a 1000w hps and (4) 135w LEDs (1580w) in my flower tent. When conditions permit a plant spends its first 3-5 weeks of flowering under the hps (usually 600 sometimes 1000w) then the last 2-7 weeks are spent below the LEDs as they have UVB which increases the occurrence of the trichromes. I’ve never seen so many Trichs on a sativa! I list the entire 1580w as used in flowering. Since these smell so much more intense than their predecessors I should wait until they dry and cure some. Thanks for following along. Ok they have had some time to cure, still pungent but with a tropical undertones. The high is soaring and energetic it took me 20 min to smoke half a joint cause I forgot I was holding it. That half joint buzz ran for 4 hours! Just planted one of these. Thanks for such a great journal. @Ripper, glad to do it!! @PigBearMan, buds are dense sticky and covered with frosting! 1/8/18 Been a month and still cannot describe the smell as much other than pungent (not at all in a bad way). I still cannot smoke a whole joint in one sitting (almost 35y experience). I hope you understood how rare that is. Think Tommy Chong. Congrats on winning last months contest!! 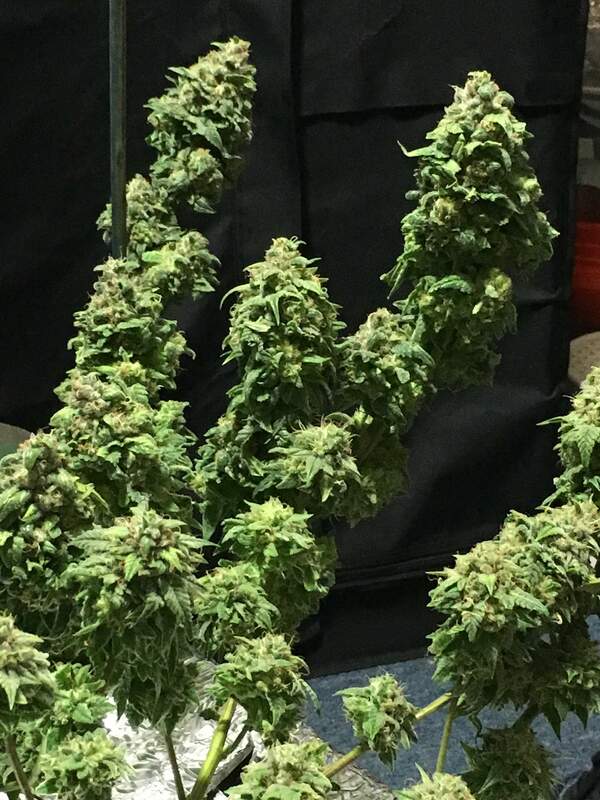 What a killer Sativa harvest. I appreciate the explanation of your HPS/LED combo during flower for more Trichomes. @Zannabis7, lol this isn’t the zombie diary. Taz must be stoned again. @Tazard, Nice. are you going to post some photos of the tie down. I would like to see this! Glad to hear no light burns! So do clones stay compact? @CAMOGROWN, no, since they were monster (flowering) clones they take 4 weeks to root and begin growing vegatively again. So I only grew them for like 2-3 weeks. @Excalibur, It was fun to watch the explosive growth once they re-vegged. However, due to the amount of time to re-veg it’s not worth it unless you’re trying to save a genetic you don’t want to lose. Nice. I have read in to re-vegging but saw no benefit, so left it.